For years Metro 2033 was used as a benchmark test for the latest graphics cards, so it feels strange to already be seeing a remastered version hit the digital shelves. It's easy to be cynical and assume that Metro 2033 Redux is aimed squarely at the console market, whose under-TV boxes have only just caught up with Metro 2033's full majesty. It's finally a way for living-room dwellers to see what the game is like with all its video options switched on. But what's the value for PC players? Well, Metro 2033 Redux is an honest to goodness, genuine remaster. A collection of tweaks and polishes, do-overs and rejigs that elevates the game to even greater heights, this is a full visual revamp that brings it in line with Last Light in terms of graphical tech. If you haven't played Metro 2033 before, this will now be the best place to start. It's post-apocalyptic FPSing at its finest, with a uniquely grim backdrop and appropriately negative portrayal of mankind in the midst of that. The premise of Metro is that the surface of Earth is scorched and irradiated, so the people of Moscow live within the tunnels of the metro (hey, that's the name of the game!) while the Dark Ones above their heads plot against them. A feature which gives you the option of bartering high-grade ammunition for better guns/upgrades or using them to, you know, shoot mutants is a standout innovation that creates tension in how you approach combat. Scarcity of ammo is a staple of the survival horror genre, but never before has finding a stash of bullets prompted such an internal conflict. For a game with a grim colour filter, 2010's 2033 was also remarkably pretty. 2014's version is a marked difference. I'm not talking a little texture upgrade here, I'm talking new meshes, new animations and reworked environments. Metro 2033 Redux is Metro 2033 tweaked and polished to a high standard; this feels like the definitive version of the game 4A originally wanted to make. Even down to the main menu screen. It's the same, but vastly improved. It's not like the old one is looking particularly weathered, it's just that the difference in production values here make it worth paying for again. There are other smaller changes to the Redux edition. 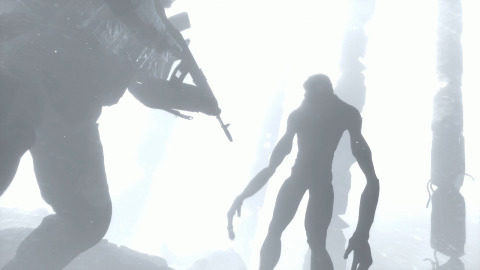 Cutscenes have been reworked so that the camera never leaves protagonist Artyom's perspective. Again, there was nothing wrong with wresting the non-interactive viewpoint away from the player from time to time in 2033, but such a change demonstrates that this is closer to their vision of how this story should be told. In such a tense, atmospheric game heightening the player's engagement with the narrative like this just feels like common sense. 4A has revisited every aspect of 2033, evident in the improved lighting and weather effects, the expanded environments, added secrets or even the addition of some of Metro: Last Light's better features, like weapon customisation. So is it worth buying again? Absolutely. Especially since you can grab Metro 2033 Redux for half price on Steam if you already own Metro 2033. If you don't already own it, then $24.99/£17 for an excellent game that you should have played by now anyway is a pretty damn good deal.